Hello, everyone. Hopefully, all is well with you. Today, I have an excellent post for y’all. Many people need money quickly. Someone asked me a question the other day. Is it possible to transfer money from a credit card into a bank account? I sat there and thought about it for a minute. There are a few ways that you can transfer money from a credit card to a bank account. Today, I want to go over three of those ways. The first way that you can transfer money from a credit card to a bank account is to consider a money transfer card. A money transfer card is not to be confused with a balance transfer card. The big difference with a money transfer is that it allows you to transfer cash to your bank account. Balance transfer cards don’t do that. When looking for a money transfer credit card, make sure you review the fees. Most of them have a transfer fee. Some don’t charge interest on the cash, though. The money transfer card will give you a length to pay the money at 0% interest. It might be cheaper to do this instead of repaying a debt on your current interest rate. The second way that you can transfer money from a credit card to a bank account is by using an ATM cash advance. An ATM cash advance is when a cardholder withdraws money from their credit card via an ATM. The cash advance will be a percentage of your credit limit. For one of my credit cards, my credit limit is $3600. I could only get $1100 with a cash advance. Cash advances typically have a fee of 3 to 5 percent. To complete a cash advance on an ATM, you will need to know your PIN code. If you don’t have your PIN, you should contact your credit card, provider. They will be able to get the info to you. Once you have that cash, you will be able to deposit it into your bank account. The final way that you can transfer money from your credit card to your bank account is by using a credit card check. A credit card check is a check that your credit company offers as a way to write yourself a check for whatever you need at the time. I recently paid off one of my credit cards, and I’ve been receiving credit card checks from the provider for the last three months. I haven’t used them and I probably won’t. The interest rate is very low, but I’m not looking to attain any more debt at the moment. 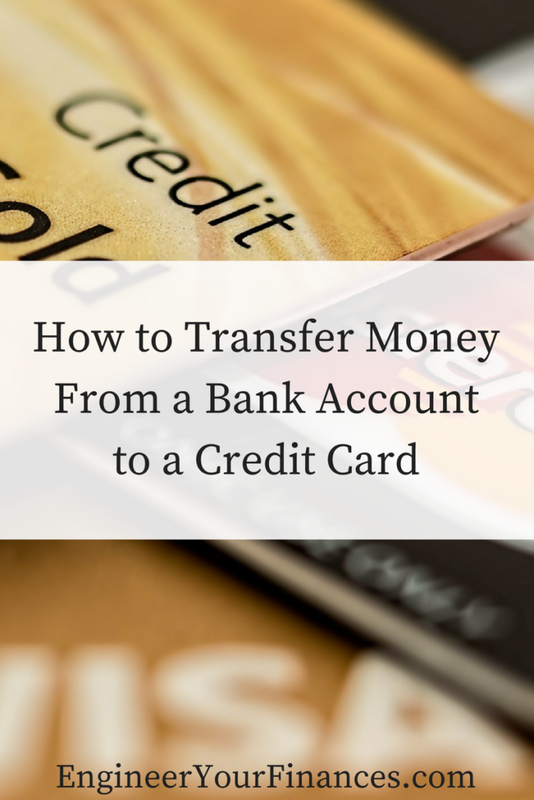 In review, there are three ways to transfer money from a credit card to a bank account. Using a money transfer card, an ATM cash advance, and a credit card check can help you get those funds into your bank account. Have you ever used any of these ways to transfer money from your credit card to your bank account?